I’m reading the fascinating Sacred and Herbal Healing Beers by Stephen Harrod Buhner, and was quite taken by the myth of Mani, the magic baby girl born of a vigin birth who died after a year of life. Where she was buried a plant grew and all the birds of the forest came to eat this plant. The people ate her and became drunk– so goes the Amazonian story of fermented cassava or manioc beer. There is a recipe in the book for Manioc, and I am tempted to try it. Early fermentation was always seen as miraculous– a gift of the Gods. This is universal. How much more so this must be when the fermentable sugars come from a starchy plant like the cassava, which contains cyanide when raw. Manioc is akin to chicha– the boiled grain is chewed and saliva converts the starch to fermentable sugar. It’s a family activity, this chewing. I have tried it with my brewer friend, Bob, and have written about that in a previous post in this blog. The traditional ritual of brewing manioc requires a “slayer” as well as the brewer (always a woman) who will acknowledge the being-ness of the plant– it’s soul. The intimacy of mastication as part of the process, and the metaphor of flesh (of a baby in the case of Mani!) is reminescent of communion as well as the English folk song, John Barleycorn– so appropriate this time of year, especially around rural Yorkshire, where the evidence of the harvest gilds the landscape. For the first time in my life, I have a small space to grow things. I tried to grow vegetables this summer, which felt more like winter. If I had to live on what I grow, I would starve. Only one tomato plant flourished; I babied by bringing inside and it has taken over my tiny kitchen. And the rosemary, which I planted over a year ago from seed: it waited 8 months, refusing to come up in the old rental house and only showing itself once we were rooted in our own home. I always dismissed the idea of talking to plants as a fantasy from my 1970s childhood. But growing food taught me that plants have their own desires and wiles and a green thumb (which I do not have) requires not only knowledge of the “Gardener’s Question Time” type, but a knowing, the way one knows a friend. I lied. When I was very, very little my family had an allotment. I remember digging in the ground with my father and I asked him if that is where he found me. This is one of my first memories, and perhaps one of the reasons the legend resonates. Octoberfests are coming up everywhere– a last hurrah of the harvest season, a time intimately related to life and death. I might go looking for cassava in the Leeds market, which feels a bit like an outpost for stranded expats and old locals who remember it in its heyday, but that is a subject for another post. If I find the cassava, who will chew it with me? The Hymn to Ninkasi necklace is featured in this beery Etsy treasury! The beer goddess necklace has been featured in this stout-themed treasury on Etsy, full of valentine gift ideas for your beer lovin’ love. History often shines a miraculous light on what we take for granted. Who first learned to turn the heel of a sock when knitting it? Who first knew which herbs would cure or kill? And who first discovered brewing? There are many legends across cultures, but when confronted with the details of the thing it’s no less startling. The goddess is both the brewster and the brew itself. The rhythm and repetition, the vivid scene rendered in each stanza reminds me that brewing is very much a fun time, some cooking and cackling over a boiling pot– but it’s also a ritual, a visit with the ancestors who once saw brewing as such a wonder, they sang about it. I was inspired to make the necklace pictured in the post after reading this poem. I have many elegant beer-inspired designs in the Feral Brewhaus section of my etsy shop. This blog has been quiet for a while, but not for lack of beer in my life. Perhaps there is too much good beer in York– it is everywhere, making blogging about it a bit overwhelming. Just yesterday I walked to my optometrist and smelled that boggy bakery smell of a working brewery– York Brewery was no doubt cooking up some Centurion’s Ghost or Yorkshire Terrier. I look forward to the opening of the York Tap this month– a stone’s throw from my house. York has been good to me. The local branch of CAMRA invited me to be a judge in the beer fest this year, and I have gone on many happy pub crawls in this beautiful city I now call home. In the meantime, while I consider ways to talk about the quiet delight of beer in York, I thank you for stopping by this sleepy blog. In my pieces I like to work with pewter from Green Girl Studios. When I saw this hop flower pendant I knew what had to happen. I busied myself collecting a range of semi-precious stone beads to represent the Lovibond or SRM scale– the rainbow of beers. And here it is in all its glory– The Lovibond Hop Flower Necklace–the convergence of my beer geekery and jewelry design! I’m sure you have coworkers, friends and relatives who share your love of beer. What do you buy them for their birthday or as a thank you or just a dude-you’re-awesome present, besides more beer? I’ve carefully combed the hand-made Emporium of Etsy to find the best beer-related gifts from small makers. Here is a hand selected array for yourself or your beer peeps. May you never be without a beer related gift idea again. Within the tiny city of York, circumscribed by the ruins of the medieval wall, there are myriad pubs. I have not been to them all, and will probably never get to all of them. York is also the “most haunted city in England.” And I would believe it. Even my own cottage seems to have a ghost, or so one of my house guests claims- he came down from the ceiling to greet her. She described someone who looked a bit like Minty off Eastenders. Ghosts are a part of the tourist trade here– men in stilts and archaic clothing hawk nightly tours, and on any night you can see similarly dressed men spinning yarns for gaggles of tourists who gasp and laugh at their storytelling. Many of the churches are haunted but if one were to do a ghost-for-ghost accounting I would bet pubs would win out. 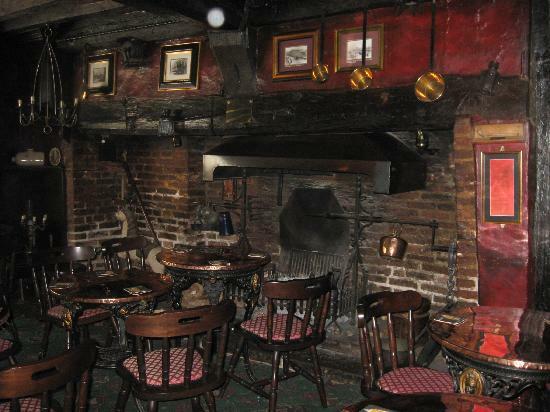 Just the other night I was in the Black Swan, a beautiful 15th century inn inside of the city walls. It has an archetypal look, like something out of a fairy tale, with black beams and iron fireplace, decorated antiques of rough domesticity– kettles, pots, bed warmers. The space is intimate and friendly– you can hear everyone’s conversations and on the night I was there it was a convivial, fascinating crowd– ramblers, older women in bright colours sitting together, a woman in a cocktail dress with her suited-and-booted date. At one point the pub was packed with a ghost-trail tour which ascended the stairs looking for “Legs”. He is, you guessed it, reduced in the afterlife to a pair of limbs. There are other ghosts here: a woman in white (isn’t she always?) looking after the fire, a man in a bowler hovering by the bar, waiting for someone. The woman beside me kept looking around– at the Toby jugs on the shelf, lit from beneath and looking like disembodied heads, jolly trophies. The iron chandelier, empty of candles, kept swinging of its own accord. 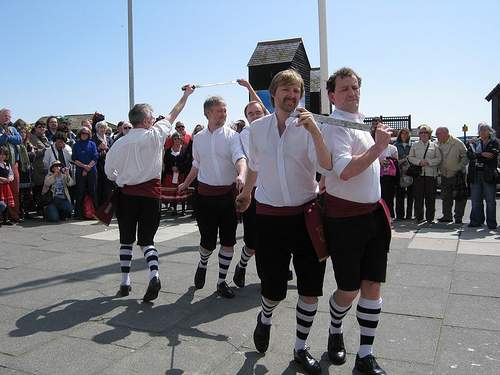 Over a door behind the bar hangs a set of Morris Dancing knives, woven in the shape of a pentagram. These knives first became known to me watching the Wickerman as a girl in the early 80s. (My parents forbid me to see it, which of course made me even more curious, and in many ways this film has had a formative effect on my imagination but that is for another post.) The knives appear in the famous masked “chop-chop” scene, where the be-wigged Lord Summerisle, played by a histrionic Christopher Lee, sends foaming barrels of ale into the sea. The woman next to me shuddered and declared the place “creepy,” staring at the knives which I suppose could be a bit sinister. That night at the Black Swan I had a Copper Dragon’s Golden Pippen, malty and light with a delicate bitterness, perfect served though the sparkler. Then I unwisely changed to Theakston Old Peculiar, one of my favourite beers. This pint tasted sour, as if the lines were not cleaned properly. Next to Landlord, Old Peculiar has to be the most wildly varied cask ale I’ve ever had– no two pints are ever the same. But this one had none of the characteristic dried fruits and dark malts, all the sweetness siphoned out of it. I blame Legs. 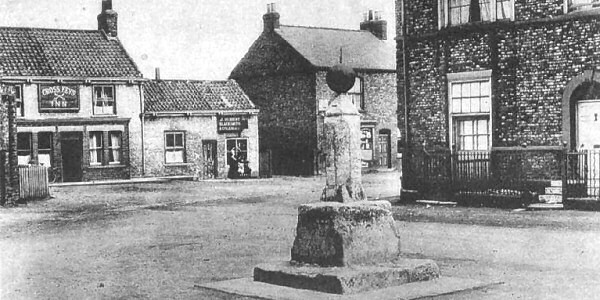 Dunnington looks the same, except now there are smokers' tables outside the pub. Moving from North London to a village in Yorkshire has carried with it a bit of culture shock. And, to be American in this little village is even stranger. Men will come to the door offering to cut trees or wash windows and when they hear my accent will ask for the person who actually lives in the house, or they ask me when I’m going home. Despite these provincial reactions, this place is big enough to have three pubs. There is a pub called the Windmill which is right off the busy Hull Road, surrounded by a large parking lot. It looks like a typical roadside pub, a bit lonely and incongruous. I should brave it because maybe it’s not such a locals place. But I am a local. Oh, nevermind. The Cross Keys is technically my local. One night I was killing time before stopping by the vet’s across the street and I got myself a pint of Black Sheep Bitter– the only ale on cask at the time. It was perfectly fine, but nothing special. There was a decent crowd on the week night. The place was full of grey haired men in quilted coats, all dark green or navy blue, some old age pensioners waiting to eat. Are these the salt-of-the-Earth Yorkshire folk who people Herriot’s books? Are they property owners full of aspiration, looking after their patch of grass? The Cross Keys was obviously done up proper in the 80s and now the upholstery was looking a bit greyed-out. What was once a cozy colour scheme of vanilla and burgundy has faded to fusty. None of this would matter if it were the kind of pub that dispels loneliness. Such is the magic of the best kind of British pub– a woman can go in and drink unmolested and maybe even strike up a conversation and feel at home. Frustratingly, this is almost that place. It was the music. I would rather have silence than some kind of pollution parading as canned craic. Overhead, buzzing from large speakers, a CD played generic covers of 70s pop songs. Was it a pub equivalent to the Musak of the dentist’s office? You can forgive even shite if the music reveals something about the person pulling the pints, or even the punters. I looked around at the men drinking their pints, the young blonde barmaid with a drunken-dare star tattoo on her shoulder, the landlady in sensible separates with her pad in hand taking food orders orders. Was anyone listening to it? You Got a Friend sung by some random studio musician. It’s enough to send you on the next bus into town. Yesterday was bottling day– all the Cold Moon Pale Ale has been bottled, quite neatly, thanks to a spigot-bottling stick. No more sticky wrasslin’ with the siphon tubing! The Cold Moon was all about using up what I had– some light spray malt, crystal malt grains and cascade hops and calling it a Pale Ale. It was my first experiment in dry hopping as well. Thanks to Simon, Oblivious and Zak for the pointers! I dropped thirty pounds in this place, feeling like a chump, leaving with the wrong stuff entirely. But, I’m brewing with it anyway. Generic ale yeast & extra-light spray malt will hopefully be tempered by chocolate and black malts for steeping and loads of cascade and Amarillo hops which will be added late in the boil, and later to the fermenter (dry hopping). One of the best things about brew day– the hops and boiling wort make the kitchen smell like some bacchanalian garden of plenty. Oh, and it’s a good excuse to make a dent in the stash– in the name of research. I’ve had a bit of Dogfish Head 60 minute and Meantime Coffee porter. Oh, by some sympathetic magic that I might make a melding of the two!